Here is a very silly 3-part round about bicycles. You can pay whatever you want for it – just email me (chris@hutchingsmusic.co.uk) and say how much you’d like to pay for it, and your choir’s name. I’ll send you the score. I can send you an invoice if you need one for tax purposes. You can pay as little as £1, or as much as $100 if you’re feeling generous! Payment by Paypal preferred. If your choir genuinely has zero budget (no payments for performing, no ticket sales, etc.) 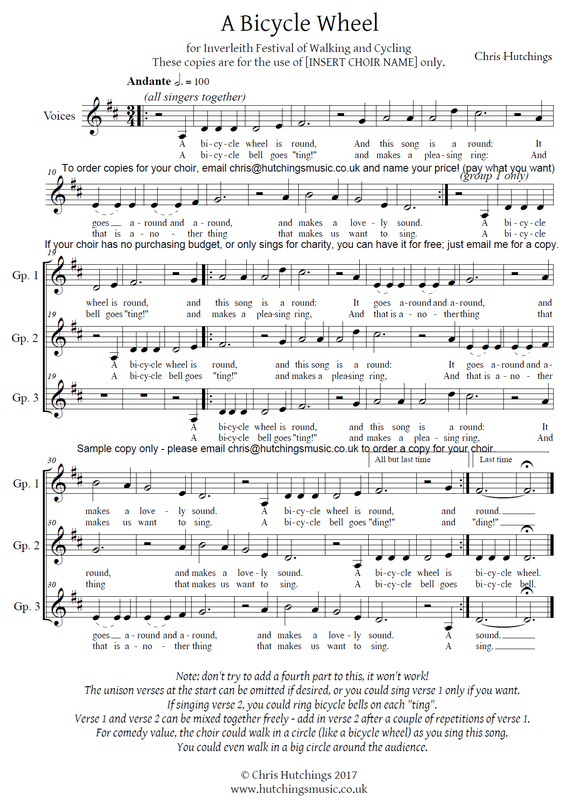 I’ll still happily send you a copy, just email me the choir’s name. It’s not quite a typical round – most rounds for choir singing have a repeated structure of 2 or 4 chords, but this one has a circular chord structure (which is why it doesn’t work in more than 3 parts). The underlying chords go D – F#m – A – C#dim – Em – G – Bm – D, moving up by a third each time – so if you have a class who are working on music theory, they might find this quite interesting.